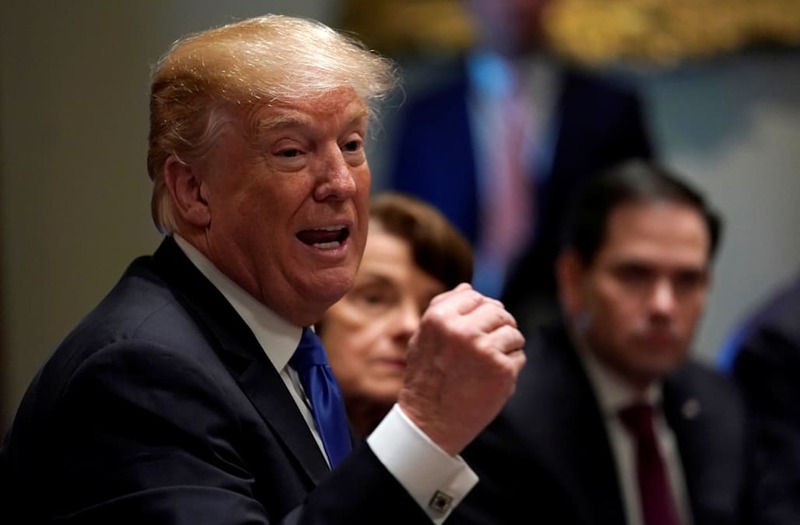 Republicans and some conservative-leaning personalities have been unsettled by President Donald Trump's nebulous positions on gun control this week. The most telling sign of that frustration came after Trump held a televised meeting with lawmakers on Wednesday, during which he nodded and agreed with Democratic proposals while outwardly dismissing his Republican colleagues. Fox News host Tucker Carlson subtly jabbed Trump about that on Thursday night. Hours later, Trump touted what he called a "great" Oval Office meeting with the NRA. President Donald Trump has taken some heat this week over his nebulous positions on gun control. In the weeks after the deadly Parkland, Florida, school shooting, Trump has, at turns, been sympathetic to student survivors who are demanding action to address gun violence, and he has sought to appease gun-rights proponents who are impervious to calls for reform. Trump has also bounced from blaming Democrats for not doing enough to act on gun control, to telling a bipartisan group of lawmakers, "I like taking the guns early," and pivoting away from Republicans on how to limit access to guns when mental illness is a factor. During that same bipartisan meeting on Wednesday, the president needled Republican Sen. Pat Toomey of Pennsylvania: "I think you're afraid of the NRA," Trump said. "Trump met w/ lawmakers on gun control where he bullied GOP who defend the 2A & said govt should 'take guns first, go through due process second,'" Fox News host Tucker Carlson said Thursday night, indicating his disapproval of Trump's conversation with lawmakers a day earlier. Carlson is usually supportive of Trump and his policies. "Imagine Obama saying something similar? He'd been denounced as a dictator. Congress would talk impeachment. Some would mutter secession," Carlson said. A little more than an hour later, Trump — who makes no secret of his preference for Fox News, and often tweets in response to things he sees on the network — tweeted: "Good (Great) meeting in the Oval Office tonight with the NRA!" Trump offered no additional context, but Chris Cox, a National Rifle Association lobbyist, claimed Trump and Vice President Mike Pence had indeed meet with him Thursday night. "We all want safe schools, mental health reform and to keep guns away from dangerous people. POTUS & VPOTUS support the Second Amendment, support strong due process and don’t want gun control," Cox said.